At Building Surveying Solutions we are able to provide a written record of the condition of a property by producing a detailed Schedule of Condition, which can be supplemented with a photographic record as required. There is a requirement at times for Schedules of Condition to be taken of adjoining premises as a precursor to certain types of building work being undertaken which might cause damage to these neighbouring premises. A Schedule produced for such situations is normally agreed with the neighbours appointed surveyor. Upon completion of the works (or during, should any damage be recorded to the neighbouring properties), both the neighbours surveyor and the surveyor acting on behalf of the one executing the building works agree any difference in condition and generally negotiate a settlement or agree a schedule of repairs. There is a requirement for Schedules of Condition to be taken of adjoining premises as a precursor to specific types of building work, excavations and the laying of foundations being undertaken as provided by the Part Wall etc Act 1996. A Schedule of Condition which forms part of the Party Wall Award produced for such situations is agreed with the neighbours appointed surveyor. 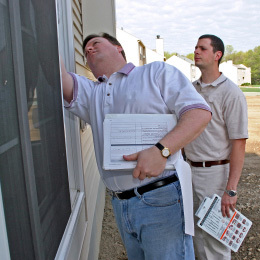 Upon completion of the works (or during, should any damage be recorded to the neighbouring properties), both the neighbours surveyor and the surveyor acting on behalf of the one executing the building works agree any difference in condition and generally negotiate a settlement or agree a schedule of repairs. Schedules of Condition can be produced for the purposes of providing a record of the condition of premises, either residential or commercial which are to be leased. Providing the Schedule of Condition forms part of the lease agreement, it can provide protection for the prospective tenant at the end of the lease term, in that it will limit the landlord's ability to serve on the tenant a comprehensive Schedule of Dilapidations and Wants of Repair. It is generally a requirement that landlords permission is obtained prior to the execution of any alterations to leased premises. It would be usual for the landlord to require that a Schedule of Condition be taken of any adjoining premises prior to the commencement of works and then checked upon completion and if necessary any repairs being undertaken at the tenant's expense. A Schedule will readily identify those areas which have suffered damage or those areas of existing damage which may have only come to the attention of the neighbour(s) during the progress of the works.